Default Locations is a list of locations that come pre-populated in Cloud that provide a template of Locations to be added to every new Quote you create. 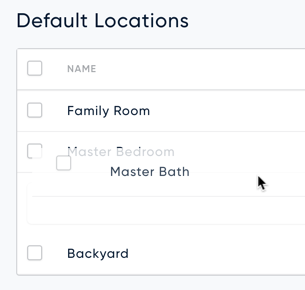 Default Locations are a great way to speed up the Quote creation process by reducing the need to manage locations when you create new Quotes. Any locations you don't use can either be deleted from your Quote or they can be ignored as locations without items will not be shown in Proposals. In this article we will review how to manage your default list of locations. To edit the default list of locations you will first need to navigate to the Settings area of Cloud. Then click the "Default Locations" menu item under the "Quote" category. To create a new locations, use the "New location" button in the upper right corner of the locations list. Each new location consists of a name which is required and an optional description. You can edit an existing location's name or description by clicking on the location or choosing the "Edit" option from a location's more menu. The location list supports drag n drop to change the order in which the locations are displayed in your quote. Default locations are a great way to eliminate some of the setup for each new Quote but they are not required. 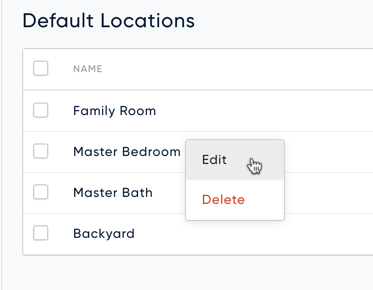 If some or all of the locations found in your default list are not required you can remove them by choosing the "Delete" option in the more menu or detail view of each item. 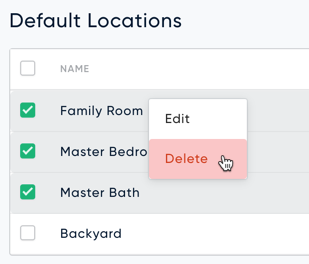 Additionally, you can delete multiple locations at once by selecting the locations to be deleted and then choosing the "Delete" option from one of the selected item's more menu.